You can use all of the vegetables you love in this amazing pasta dish- edamame instead of chickpeas, more or less of your faves but this is a WINNER- PERFECT for pot lucks and summer gatherings. Cook the pasta according to directions, drain and let stand until cool but warm. In a large bowl, mix all of the veggies with the other dressing ingredients and toss well. This mix should be well seasoned before adding the cooked pasta- if not adjust for saltiness, sweetness as desired. Add the pasta and with a large spoon, mix well until all of the pasta is well incorporated into the vegetable dressing. Allow to stand on the counter for at least 30 minutes- I am not sure why, but this prevents the Gluten-Free pasta from getting hard when it is refrigerated! You can enjoy this at room temperature or cold. FRICKEN delicious. 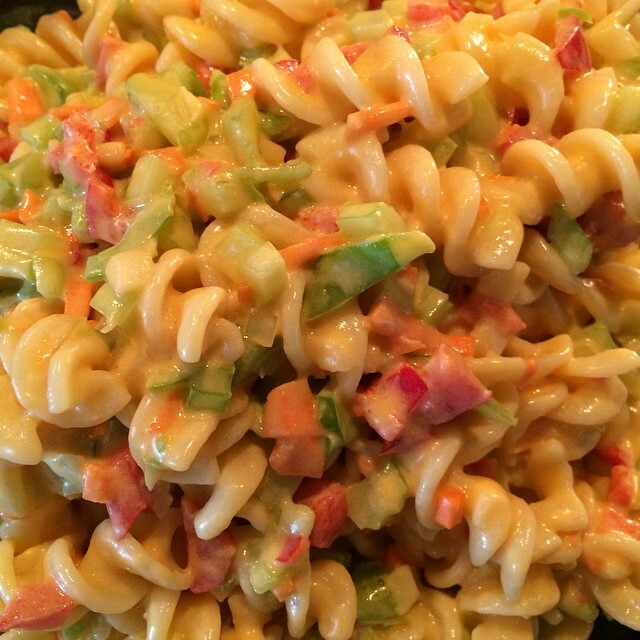 This entry was posted in Gluten Free, mains, pasta, sides and tagged carrots, celery, gluten free, onions, pasta, pasta salad, peppers, summer, VEGAN, VEGAN LOVE, vegan mayo, vegan protein. Bookmark the permalink. Reblogged this on The Vegan Love Project.